Providing you the best range of brilliant cng gas engine oil and brilliant premium cng 2t oil api tc with effective & timely delivery. Brilliant CNG Gas Engine Oil is gas engine oil intended for use in light-duty vehicles running on CNG, LPG or propane. It is formulated from selected additives to provide superior detergency and dispersancy, oxidation and nitration resistance and protection against engine wear and corrosion. It exceeds the performance requirements of API SF/CD. • Suitable for use in all seasons and helps in reducing oil consumption. • Field-proven performance in providing outstanding engine cleanliness. • High dispersancy protects against engine sludge and varnish formation. • Excellent resistance to oxidation and nitration. • Protects against scuffing and wear. • Protects against valve stem deposits and valve recession. • Compatible with catalytic exhaust system fitted in the vehicle. • Does not contain any bright stock, which can cause harmful carbon deposits. • Other spark ignited gas engines where API SF/CD quality oils are specified. Brilliant Premium CNG 2T OilAPI TC is two stroke CNG engine's oil developed to meet the critical requirements of high performance two stroke engines manufactured by leading auto makers. It is blended from selected base stocks and additives to minimize spark plug fouling and preignition, prevent rusting, minimize deposit formation and provide protection against seizure, scuffing and wear. It contains a diluent for easy mixing with PETROL/CNG/LPG. Brilliant Premium CNG 2T Oil is recommended for lubrication of scooters, auto rickshaws, motorcycles and mopeds operating on two stroke engines. 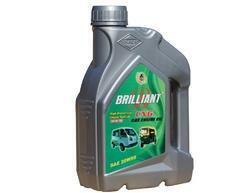 The recommended dosage of Brilliant 2T Oil is 20 ml of oil per litre of PETROL/CNG/LPG.